You’re the Children’s Ambassador for the Winterthur Museum. What does that mean? In real terms, it means I get to spend a lovely weekend at a beautiful place. In emotional terms, it means I get to beat the drum for children’s books over a longer period. Do you get diplomatic immunity from bad reviews? From your lips to God’s ears, as my grandmother used to say. As part of your ambassadorship, you’re going to be judging ABC books written by kids. How will you pick the ABCoolest one? I’ll know it when I see it, just as I read any book. I will be looking for a book that teaches the ABCs with originality, elan, clarity, and joy. If you could be any letter of the alphabet, which one would it be? Why? X because it is rare and difficult letter, yet marks the spot. I wouldn’t normally associate a picture book author with a museum on the decorative arts. How did the association come to be? They picked up the phone and asked. I LOVE the idea, though. But I think they chose me because I’m not just a writer of picture books, I write poetry, non-fiction, essays, novels – and it’s the body of work that brought me to their attention. I wish that other museums excepting the Mazza in Ohio, the Eric Carle Museum in Amherst MA, and the National Center for Children’s Illustration in Abilene TX that are already doing such activities would realize what a treasure we have in children’s books, both text and art. And I stand ready and willing to be an ambassador for them as well. Have you been to Winterthur? What was your favorite exhibit or item there? Haven’t been there yet, I live in Massachusetts and Scotland. Winterthur is not next door to either of those places. You’ve been leaving comments on a few blogs -- mine included. Yay! What are your thoughts on the kidlitosphere, as we’ve dubbed ourselves? I love what I have read so far: “smart, sensitive, joyous folk who adore children’s books”. Well, what’s not to love? But you are all so much wider read than I am these days. And I simply can’t keep up with all of you. Not and write my books, too. What advice do you have for amateur reviewers, especially the blogging variety? Besides being really, really nice to your books. Well, of course that’s number one. But be careful not to be too self referential. Spread your net wide. Beat the drum for books you love, but don’t cross the line into marketing. See the larger patterns. Emphasize the literate. Take joy. In a brand-crazy world of licensed everything, you’re a household name. You could write, well, the alphabet and it would make the bestseller list. How do you resist the temptation to allow a Baby Bear cartoon or a "How Do Dinosaurs..." action figure? Goodness, I have a hard time recognizing myself in that sentence. I didn't have a bestseller until after 200+ books. I simply write the books I want to, the books I am in love with, and let the publishers worry about selling them. I have been incredibly lucky lately, but it hasn't changed the way I write or the way I think about writing. Most children's book writers are the same. To tell the truth, most children's book authors make an average of $5,000-$10,000 a year from their writing, and the rest is made from lectures, workshops, school visits--and hardworking partners. The success of J. K. Rowling's books (and Lemony Snicket and C.S. Lewis' Narnia books etc.) are not the norm. And if we get a plush toy or a lunchbox with the book's name or a movie along the way, it is helpful to the pocketbook but is never a substitute for the book. How have picture books changed since you began writing? Are they generally better, worse or the same? Any recent favorites? Well, when I began, the illustrators who wanted color had to work on making overlays of color separation, a laborious task which has been taken over by laser technology. Concept books were really big then and are hardly seen now. Then there was a huge market for single picture book folk tale retellings. Now the bestsellers are humorous, very young, almost (or totally) wordless books. The illustrator is king. I have about 20 or more unsold picture book manuscripts in my drawer. Too many notes, Herr Mozart. Recent picture books I have liked? Patricia MacLachlan’s ONCE I ATE A PIE, Barbara Diamond Goldin’s THE BEST HANUKKAH EVER, Neil Gaiman’s THE WOLVES IN THE WALLS, Mordicai Gerstein’s BETWEEN THE TOWERS, oh my, my head is a-swirl. I’ve read in other interviews that you get annoyed at the wannabes who pester editors and agents with multiple submissions of drek. Have they ruined it for the rest of us? Well, a lot of houses have closed their doors to unsolicited submissions about the same time. You make the connection. Do the math. I started blogging about picture books because I was absolutely sure that other parents like myself had no idea there were so many great ones around. What advice would you give to new parents staring dumbfounded at bookstore shelves, not knowing where to begin? What are we looking for? Talk to your local children’s librarian. She/he should become your best friend. I never took your Children’s Lit class while at Smith. I’m deeply, truly sorry. What did I miss? What you missed is a passionate response to the history, the breadth and the depth of the children’s book field. We should BE so lucky that the counting continues. Yay for the Q&A! And what a fun contest! I wish I was ten and could enter! Me too. Kids have all the fun. Sheesh. What about kids at heart? I sense age discrimination here. I thought it was a great Q&A. Thanks for posting this Q&A. 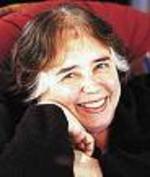 I love Jane Yolen, not only for the work she's done herself, but for her encouragement of other writers. I've opened a number of books that had Jane Yolen in the dedication page or the acknowlegements. Alkelda: I agree she's an amazing influence and muse for so many writers. And I love that she's open to us bloggers interviewing her and takes us seriously (she even has a blog). Well, it's a journal (not interactive) rather than a blog. But thanks for the nice words everybody. I love her advice to novice reviewers and reviewing bloggers, especially "take joy." Man, I wish my girls were old enough to do this. Great interview. She doesn't mince words, does she? I like that.